MILAN, Sep 12, 2013/ — Just Cavalli will participate in the 2013 edition of the Vogue Fashion’s Night Out, an event organized by Vogue in an effort to draw the public nearer to the fashion world, creating a unique situation for designers as well as for the major protagonists in the fashion system. For the occasion, Roberto Cavalli has created two limited-edition t-shirts inspired by the ‘Glam Rock’ world, honoring the young and contemporary collection of the Cavalli Maison. 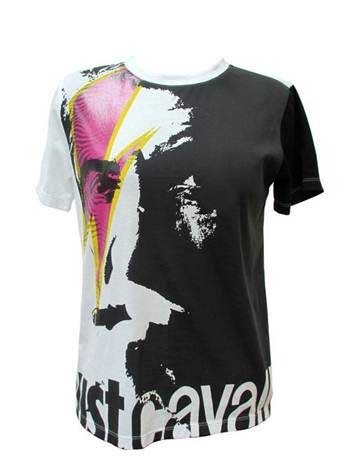 To create the prints featured on the t-shirts, Roberto Cavalli reinterpreted a portrait of himself using the iconic ‘Ziggy Stardust’ by David Bowie as his inspiration and elaborating the contrast between black and white, with bold colors such as red and orange for the men’s t-shirts and pink and yellow for the women’s t-shirts. Both variations present shiny-effect finishings. The t-shirts will be sold at the retail price of 30 Euro in the Just Cavalli Flagship Store in Milan, in the Just Cavalli corner store of La Rinascente in Florence and in the Just Cavalli corner in the Hankyu Umeda mall of Osaka. Part of the proceeds derived from the sale will be devolved to charity in support of a project selected by Vogue Fashion’s Night Out.